Sir Norman Rosenthal, the exhibitions secretary of the Royal Academy of Arts in London (1977-2008), has written about the impact of "provenance research" ("The time has come for a statute of limitations", The Art Newspaper December 11, 2008). "Provenance" is used here to describe the collecting history of a painting or object: the former owners, the collectors, the dealers and the auction-houses through which a piece has passed since its creation. Rosenthal concentrates on material taken by the Nazis during the 1930s and 1940s, but states, "If valuable objects have ended up in the public sphere, even on account of the terrible facts of history, then that is the way it is." He is unsympathetic to claims that the objects should be restored to families. 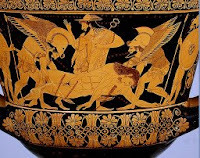 Rosethal extends the issue to antiquities and in particular the Sarpedon (or Euphronios) krater returned from New York's Metropolitan Museum of Art to Italy earlier this year. The outgoing director of New York’s Metropolitan Museum of Art, Philippe de Montebello, was forced to send the Metropolitan Euphronios vase back to Italy earlier this year. This begged the question, does Italy really need another vase by this artist, when there are others? Italy has so many great objects of this kind that one piece, however outstanding, makes little difference. To the best of my knowledge, this vase is not even on public view at the moment. At the Metropolitan, however, it could quite easily have inspired young people to get involved in, or spend their lives with, classical culture. But what is the "provenance" of this krater? We know something about the sequence of its passage through the antiquities market: a tombarolo in Cerveteri, a Zurich conservation laboratory, and its arrival in America courtesy of TWA. But what about its archaeological history? It is assumed that the krater was found in an Etruscan tomb at Cerveteri, but details of the precise find-spot are lost. Its discovery in a scientific excavation could also have "inspired" a new generation. The krater, incidentally, has been forming part of the Nostoi exhibition in the New Akropolis Museum in Athens. (And before this in Mantua.) It has been displayed alongside a range of antiquities that remind us that recently-surfaced antiquities have been acquired for public and private collections without too many questions being asked. Did Italy need the krater back? This is an outstanding piece. And the same museum has returned the Morgantina silver - surely a significant group of Hellenistic plate. Rosenthal misses what is, surely, the key issue about the returns to Italy: the disincentive for museums to indulge in the acquisition of pieces that have no recorded histories - or what he would term "provenances" - prior to 1970. I find the argumentation of Norman Rosenthal so shocking that,for once,I am lost for words. What kind of mind is this that will deprive peoples of rights they have from their predecessors simply because others whose predecessors suffered the same atrocious fate under the evil Nazis did not have art works? That history is history cannot mean that we must accept the nefarious acts of groups such as the Nazis. That claims arising from Nazi atrocities have still not been settled is surely a sad commentary on the commitment of certain governments to uprooting such evils but clearly we cannot blame the great-grand children of Nazi victims from pursuing their claims. It would be terrible if future generations would simply cease to pursue their legal rights because of the time it takes to go through legal systems which have always been on the side of the mighty.